Multiple Warehouses – Select if you require more than one warehouse. Post adjustments to GL – When adjustments are made they will get posted to the GL. Default Adjustment Account – Default GL account to post inventory adjustments to. User can override the account on each adjustment. Transfer Markup Account – If a markup is required when transferring inventory, then a GL account will be required to post the markup to. Typically a sales account is used here. It will then debit the percentage set below to the inventory account setup for the receiving warehouse and credit the sales transfer markup account. 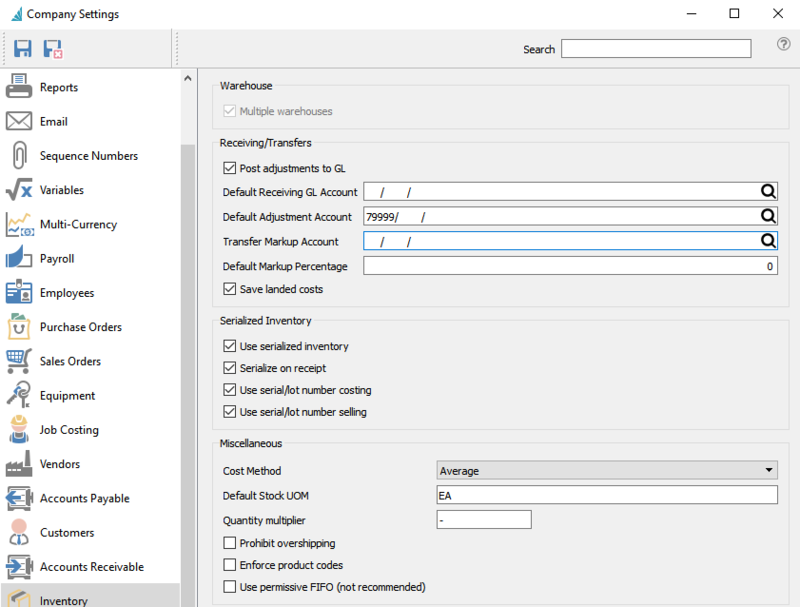 Default Markup Percentage – What default percentage will be used for inventory transfers if setup above. Save Landed Costs – Automatically save the freight and Duty/Brokerage percentage entered on a purchase order to inventory for future orders. Use Serialized Inventory – Use serial numbers. Note that this setting is also used to activate the lot numbering option for items. Upon Receipt – Serial numbers are received into inventory for later selling. Otherwise, you can enter manual serial numbers on a sales order. Similarly, lot numbers can be assigned when an item is received, or when an item is sold. Use serial/lot number costing – Costing for sales history and GL transactions will come from the individual serial/lot number instead of the inventory item. !When this is turned on a journal entry may get posted to adjust costs to match serialized costs. Use serial/lot number selling – Sell price will come from the individual serial/lot number. Default Stock UOM – When adding a new item to inventory it will default to this unit of measure. Quantity multiplier – The user can use a shortcut character to multiply an item in POS. ie. if the multiplier is set to * then when 6 of an item are required the user would enter 6* and then scan or type the item. Prohibit overshipping – Inventory cannot be consumed below zero on hand. !It is not recommended that the company allows over committing of inventory as the cost that will be used in sales and production will not be accurate.When a PO is received for an item that was negative and the cost was different, the difference will be posted to the cost of goods account for that item. Enforce Product Codes – Require product codes when adding inventory items. User permissive FIFO (not recommended) – Allow over shipping of inventory when set to FIFO.